this weekend was absolutely exhausting. we spent most of the day on saturday helping our friends move into their new apartment two hours away in new jersey. we can't believe that they are living so far away now, and we are going to miss them like crazy! on sunday, we spent the day at home trying to catch up on various chores on our to-do list. have you ever had a day that just felt like one giant comedy of errors? well, that was sunday for us. what a mess. one of the only things that was not a mess on sunday was breakfast. in the fall, we love to make as many pumpkin recipes as we can. so, for breakfast on sunday morning we made pumpkin spice waffles. 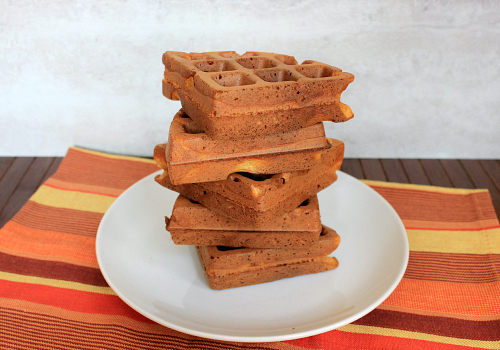 these waffles are the perfect fall breakfast. they are loaded with pureed pumpkin and spices, and they make the kitchen smell amazing as they are cooking. they are crispy on the outside, and they are light and fluffy on the inside. we served these waffles warm, fresh out of the waffle iron, with pure maple syrup. 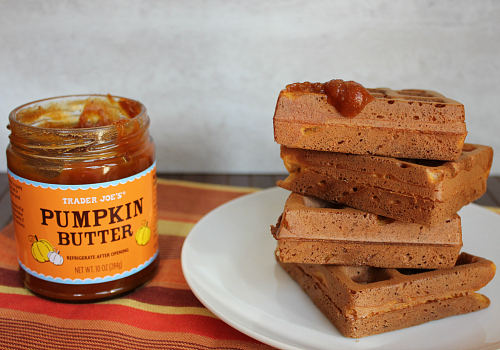 we also spread a little bit of trader joe's pumpkin butter on our waffles too. (pumpkin butter reminds me a lot of spicy apple butter.) hey trader joe's, you have a winner there with that pumpkin butter for sure! preheat your waffle iron according to the manufacturer's instructions. in a large bowl, sift together the dry ingredients. add the milk, pumpkin puree, and egg and whisk well until no lumps remain. stir in the melted butter. 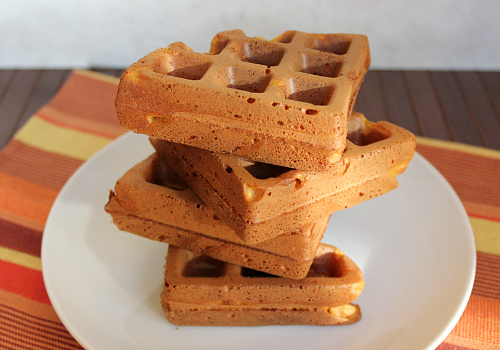 pour enough batter into the waffle iron to just barely cover the waffle grid (usually about 1/2 cup of batter). close the waffle iron and cook until the waffles are crispy on the outside and cooked throughout on the inside (about 6-7 minutes). once cooked, transfer the waffles to a baking sheet and keep them in a warm oven while you prepare the remaining waffles. serve hot with maple syrup. 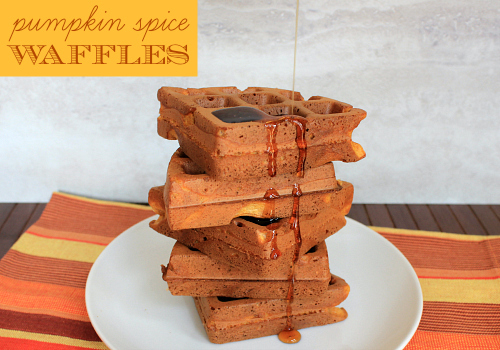 ps: be sure to check out our recipe for pumpkin spice pancakes too! Yum, they look good. I will have to try them.